The Rap Up: End of the Year! What’s going on with Kyrie, Kehlani and PND? 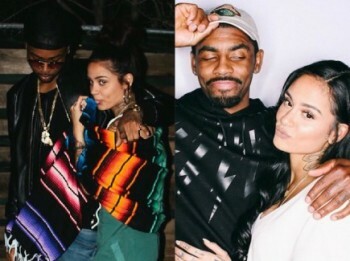 As many of you may have recalled, Kehlani and Cleveland Cavaliers star point guard, Kyrie Irving, were in a relationship. Over the last week, an image surfaced on Party Next Door’s (Kehlani’s ex-boyfriend) instagram. The image included a hand that had the exact same tattooing that Kehlani does on the same hand. This photo was also taken in bed, firing up the rumours even more. While rumours ran rampant that Kyrie and Kehlani were still dating, the former was quick to clarify exactly what the situation was on his twitter feed. He provided clarity that him and Kehlani were not in fact dating at the time that Party Next Door posted the picture. Later that day, Kehlani posted a picture of herself hooked up to a UV packet while in a hospital bed, stating that she wasn’t cheating and that she had tried to end her life that day. Later, she thanked Party Next Door for everything he had done for her. While this situation is still very confusing, Kyrie handled it in a very mature matter, assuring that PND was handed the L and not him. While this may come as a surprise to some, many can expect Meek Mill to continue his losing streak that is his life. Meek, currently serving probation, reportedly ordered his crew members to go to a Footlocker that Quentin Miller was at and force him to admit that he was indeed a ghostwriter for Drake as well as issuing an apology to Meek for making him look like an idiot. Well, Miller refused and one of Meek’s henchmen knocked him out. Meek then went on Instagram and posted a photo of Russell Westbrook with the caption being ‘what?’. Meek has since proclaimed that he knows nothing about the attack and that he did nothing to contribute to the situation. Whatever the issue is, Meek is still taking L’s this year. Speaking of Meek, his arch rival Drake has had 2 songs from his upcoming album, Views from the 6, leaked. The first song, entitled Controlla, features reggae artist Popcaan. Controlla is more of a slow burner/reggae dance hall type of music. It’s similar to Drizzy’s song with Rihanna, Work. The second song is an electronic ballad entitled These Days. I personally don’t like it a lot and compared to something you’d hear in your grandma’s ’99 Lincoln sedan that still has a cassette tape player. I’m just excited for Views and hope that it’s 6God’s most lit album to date.